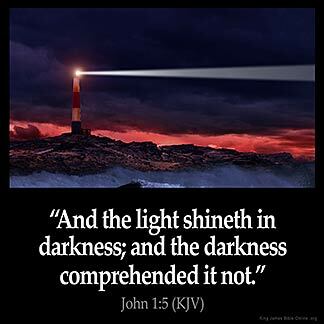 JOHN 1:5 KJV "And the light shineth in darkness; and the darkness comprehended it not." 2The same was in the beginning with God. 3All things were made by him; and without him was not any thing made that was made. 4In him was life; and the life was the light of men. 5And the light shineth in darkness; and the darkness comprehended it not. 6There was a man sent from God, whose name was John. 7The same came for a witness, to bear witness of the Light, that all men through him might believe. 8He was not that Light, but was sent to bear witness of that Light. And the light shineth in darknesse, and the darknesse comprehended it not. and derknessis comprehendiden not it. 1:5 And the light shineth in darkness - Shines even on fallen man; but the darkness - Dark, sinful man, perceiveth it not. THE light of GOD is our security ,protection living in GOD 'S LIGHT MEANS living with our LORD JESUS CHRIST,walking with him day after day ,forever and forever i have made up my mind to walk with JESUS CHRIST and enjoy my living with GOD 'S LIGHT. God is the only true light. He must be preached as the light in the world at large. In God we trust. Light is truth, and truth is God. Within themselves no person can improve from without. Every improvement has to come from within self. Sit quietly and listen to the light within.